I've been on quite a sewing kick the past few weeks and this is my third quilt of the year! I did end up stippling this quilt for the quilting and am really happy with how it turned out. It washed up extremely crinkly and I think that goes so well with these fabric designs. The picture shows about half of the quilt; it's made with 10 blocks across and 12 blocks down. For the backing, I made some wonky log cabins with some of the extra fabrics. I really enjoyed making those blocks... I'm going to have to make some more! The offset design of the four blocks in the corner is like what Ashley over at Film in the Fridge does. 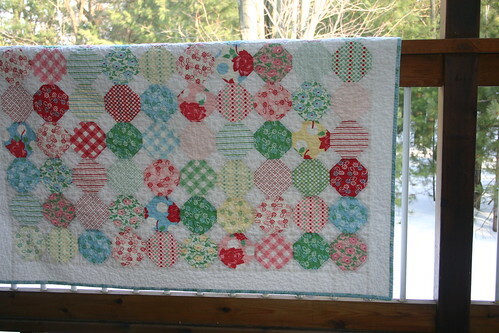 I can see why she makes that style of quilt, they're fun to make and look great, too! measures approx. 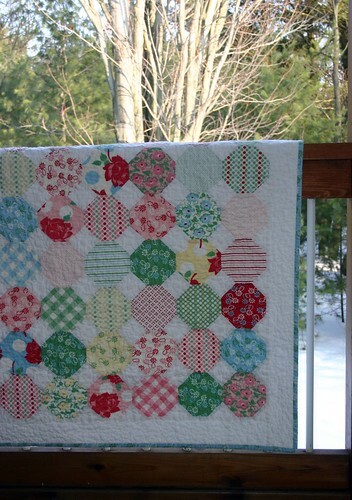 : 48" x 55"
Here's a great tutorial for a snowball block, if you're looking for one. (In my quilt, the patterned squares started out at 5" and I used a 2" solid colored square in each corner.) 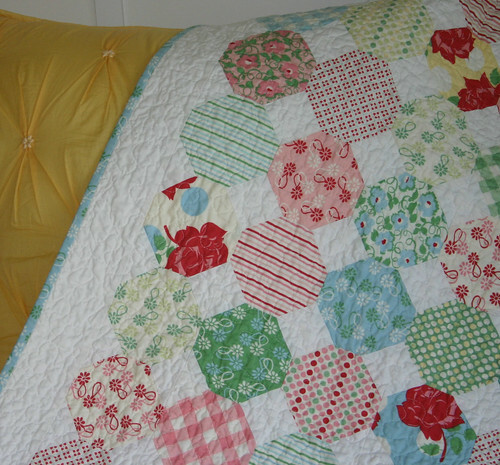 It's a simple quilt that is quick and easy to make! 3 quilts already is amazing. go you!!! 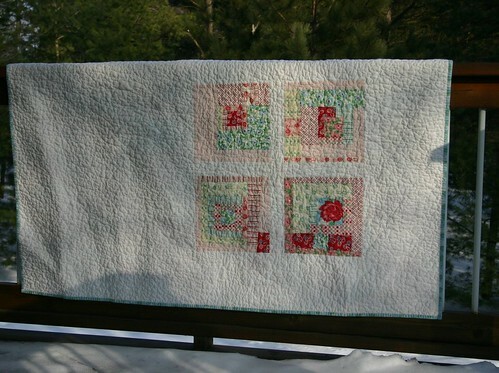 this looks beautiful and is going on the list of quilts that i want to make this year. That's so pretty! Three already? You go girl! I don't know how I came across your blog (lemonade stand award maybe?) but I was drawn right away because although my sister and I aren't twins we have a blog together. Lots of fun! Snowball is one of my favorite patterns. This is lovely!! How simply elegant! It's so beautiful!! 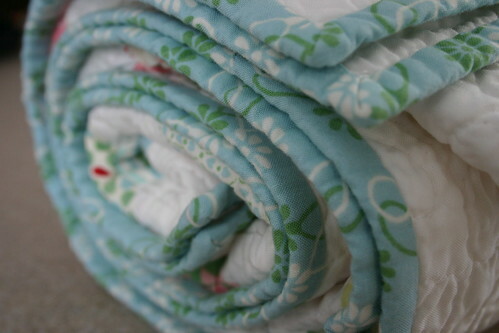 this looks beautiful and is going on the list of quilts that i want to make this year.